This bulletin does not offer easy solutions to all the problems of soil and water conservation in semi-arid regions. There is no storehouse of tested methods and techniques which can be taken off the shelf for immediate application. The conditions vary too much - the soil, the climate, the social factors such as land tenure, availability of mechanization and of labour, the place of livestock - the list is endless. This bulletin is therefore a review of techniques which have been tested and found useful somewhere, and which might be suitable for use in other conditions. Some of the methods are at the stage of being promising ideas which need more testing. Since the bulletin covers such a wide range of geography, people, and climate, it will not meet the requirements of every reader. There will be too much detail in one place, not enough in others. In particular there might be more emphasis on the Mediterranean region, where the winter rain- fall regime gives a situation very different from the semi-arid regions with summer rainfall. We are also conscious that we have not done justice to the work in the Francophone countries of North and West Africa. We have not attempted to define semi-arid areas, nor have we been concerned whether areas should be classified as arid or semi-arid. The working definition of areas which the bulletin is intended to help is anywhere that rainfall is a problem because of amount, distribution, or unreliability. We have not discussed all the problems of semi-arid areas, and particularly have omitted the questions of salinity and alkalinity, and wind erosion, and mechanization. A subject as wide as this could be arranged in chapters in a number of different ways, so we have tried to set up sign posts where a method or technique is discussed in more than one chapter. 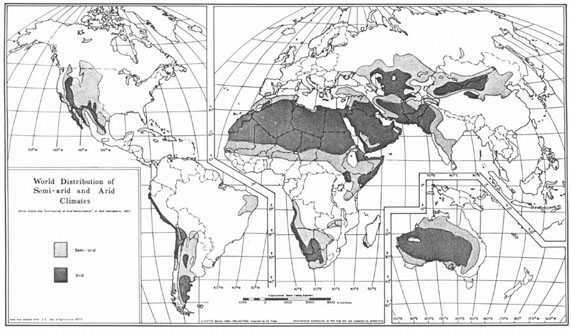 Figure 1.1 is a generalized map of arid and semi-arid areas. The bulletin does not go into detailed design of all the practices because the circumstances of soil and climate make each application different, so we have tried to be more concerned with principles. Neither have we discussed the practicability of the methods reported in terms of manpower requirements, nor in terms of costs and benefits. Whether it makes sense to apply a method will depend mainly on the urgency of the problem; if a method will keep people alive the benefit/cost ratio is not the most important criterion. The book does not discuss the political issues, such as land tenure and social systems, nor does it discuss political structure of government and the social structure of land use. This is not to imply that these aspects are not important. The consensus of many recent analyses of soil and water conservation programmes is that past programmes have been biased towards top-down projects with insufficient attention to the needs, aspira- tions and abilities of the peasant farmer who, as a result, has not been sufficiently involved. It is perhaps significant that many of the ideas and techniques discussed in this bulletin are either indigenous or have been developed together with the farmers by one-man projects operated by non-government organizations. The other feature which comes through strongly when studying successful projects, is the importance of helping farmers by training them in the use of simple equipment. Examples are teaching the use of the water-tube level to lay out works on the contour in Burkina Faso, or the use of the line level for similar purposes in Kenya. Another important non-technical contribution can be to help the organization of local com- munities to manage their affairs more effectively. In India there is a centuries old tradition of local groups to manage water affairs. There are the Pani Panchayat for general water management, and the irrigation com- mittees, Pukka Warabundi (formally structured), and Katcha Warabundi (informal). In other countries, political and social change is leading to new organizations of Cooperatives or Peasant Associations, and guiding, assisting, or training these groups may be essential for the implementation of any soil and water conservation programmes. Agricultural development naturally takes place first on the best land. Whether at the scale of the individual farm or a whole country, the tendency is to use the best land first. When there is a need to increase agricultural production it is usually directed to maximizing production in the areas which have the best potential. But as demand increases for the products of the land - food, fuel, shelter, and clothing - it is necessary to make increasing use of land which is less suitable for agriculture, or land in less favourable climates. People concerned with agricultural planning, or development, or production, must all pay more attention to the semi-arid regions. Attention has been sharpened by the widespread droughts in Africa in the early nineteen-seventies, and again in the mid-eighties, as shown by the surge of conferences and workshops in the last ten years, and the explosion of aid programmes in semi-arid Africa. It is futile to expect magic solutions to the problems of semi-arid regions. We cannot alter the unreliability of the rainfall, nor the fact that unpredictable rainfall and the occurrence of droughts are inevitable. Neither can centuries of abuse and mismanagement of the land and the people be corrected overnight. Short-term results to reduce starvation through improved yields is only part of the story; a programme to win the confidence of subsistence farmers should be planned to a timespan of at least five years, and plans to direct the attitudes of governments more towards land use will need much longer. What this bulletin tries to do is to put ideas and techniques into a large array of labelled pigeonholes, from which technicians can select components to build into a project or a programme. "It is in the nature of these marginal areas that agriculturally disastrous seasons are within the normal range of climatic variations. Such seasons must be accepted as something to be foreseen and planned for, and not as an "act of God" to be met by international charities. The difficulty of planning for drought conditions and hence of preventing famine has been increased by the great successes of science and technology in the last quarter century in the control of parasitic and nutritional disease. Improvement in health has led to great increases in human and animal populations, and these have been maintained by fuller exploitation of the environment. Thus the pressure at the margin has increased, and what was a shortage that could be met by encroachment on unused resources becomes a famine because no unused resources remain." The all too common attitude towards drought is typified by the Australian outback farmer who is reported to have explained his problems to the extension officer because "we have not had a normal rainy season for 25 years". Hutchinson's comment about increasing pressure at the margins is reinforced by Ormerod (1978) who is concerned about the problems which may inadvertently arise from economic development in dry areas, and argues that "One of the most important factors operating to increase aridity in West Africa is the economic demand which has stimulated the growth of herds and of arable farming which compete for land in the arid range areas." "There is a particular danger in stimulating economic advance in desert areas and particularly in linking nomads to the monetary system and I make the plea that, before barriers to development ... in this remote and fragile part of the world are broken down, more information should be obtained about the dynamics of nomadic grazing and of the possible effects that the extension of their operations might have upon the environment and the climate ........"
He also urges the development of quantitative techniques which could be used to assess the capacity of soils to withstand exploitation, to provide a measure of the limits to which economic development can be pressed without causing ecological degradation. A third commentary is the recent and thoroughly researched review by Sinclair and Fryxell (1985) who present a powerful argument for the view that the ecological disaster of the Sahel is primarily man-made. A recent change has been the increasing political interest in many countries to promote more agricultural use of areas of low or erratic rainfall. In some cases the main reason has been political change associated with the move from colonial status to independence, and an example is Zimbabwe. In colonial times, agricultural development and agricultural research were primarily directed towards maximizing the production on the highly mechanized large farms on the better soils in the regions with most reliable rainfall. Since independence there has been a reversal of this policy and the emphasis is now placed on development where there is the greatest need rather than the greatest opportunity, i.e. the small-scale subsistence farmer on poor soils in areas of low and unreliable rainfall. Another powerful factor which has led to increasing emphasis on production from the dry areas is the simple necessity to increase total national production. Examples of this are the massive development of grain production in the south-east of USSR, and the increasing attention to production in the low rainfall areas of Kenya. Yet another reason for opening up areas previously considered too dry for arable farming has been the development of new techniques such as mechanized minimum tillage farming which in New South Wales is leading to the spread of arable farming to the west. However increasing government interest in dry regions is not universal, and in some countries production is decreasing, because there is apparently no political will to develop the dry regions. A correspondent reports that this is the situation in Morocco, Algeria, and Tunisia. In broad terms, each of these countries was self-sufficient in food grains with average yields of around 1000 kg/ha. Morocco has maintained this average yield, but now has to import 20 percent of its food requirements. In Tunisia the yield has fallen to 800 kg/ha and 40 percent of the food requirements are imported. In Algeria the yield has fallen to 600 kg/ha and food imports are running at 60 percent (FAO 1985). In some countries a reduction in the population has made it impossible to maintain the conservation works necessary to sustain agricul- ture. This is the case in the Yemen Arab Republic, and also applies to some of the Mediterranean countries on the north African coast.